Friend, coworker and fellow enthusiast Avery Williams published her first book The Alchemy of Forever this month. A release party and reading was held at The Tip and your humble writer was asked to mix a cocktail in honor of the occasion. The book is classified Young Adult, although the content and writing work for an older fantasy audience just as well. 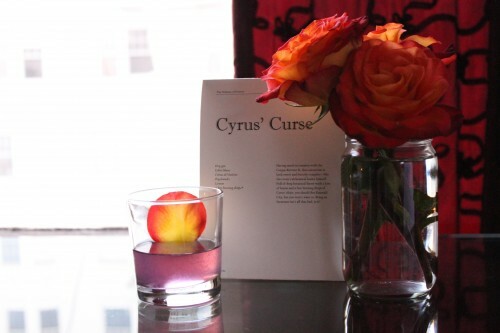 In the book, the villain, Cyrus, has a mysterious burning elixir that when ingested, makes you immortal. The only hitch is, your soul needs to find a new body every ten years or so after the old one wears out. The consistent sacrifice of innocent hosts wears on the heart of the heroine, Seraphina, to the point where she decides she must escape Cyrus’ coven and allow herself to die. 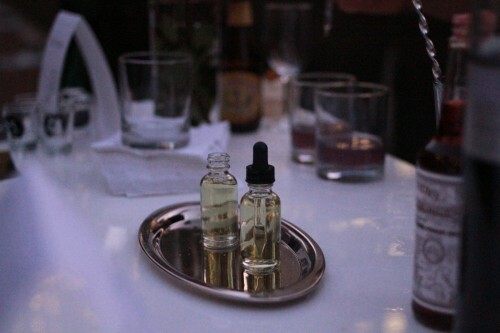 With this premise in mind I set out to develop a drink with intense and magical qualities. Absinthe, of course, came to mind. In looking through Kate Simon’s Absinthe Cocktails, I discovered that Crème de Violette is regularly mixed with absinthe—with visually arresting results. Knowing that the anise flavor can be a little much for some people, I was drawn to the Corpse Reviver no. 2 as it only includes a few drops of the stuff (also adding a nice allusion to the pivotal plot point). Using the classic recipe for C.R. no. 2 as a base, I experimented with adding the Violette. In the end I swapped out the Cointreau, added a dash of Peychaud’s to help balance it out and drastically reduced the lemon—as it was overpowering the more delicate flavors. A few drops of absinthe floating on the top gives off a nice aroma and cuts the sweetness. The result is a delightfully purple drink that is richly botanical, with a complex and slightly sweet flavor. An orange-red rose petal garnish provides a nice color contrast. See the full recipe here. 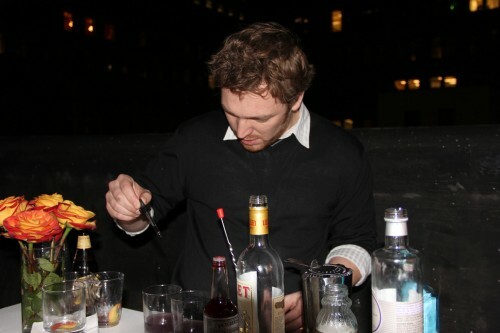 Special thanks to Faye and Roni for the bartending photos. Like absinthe? Check out our interview with Absinthia.